Gorgeous century home in historic Old East Village. Bright, clean, well maintained. Conveniently located within walking distance to many local shops, Saturday farmers market, vegan bakery, cafes, organic restaurants, fish and chips, Western fair, and independent grocery. Very close to downtown on a quiet residential steeet. Enjoy the unique charm of this up and coming neighbourhood! Ten minutes drive to Western University and Fanshawe College. Close to Victoria park and Budweiser Gardens. Recently renovated century home . Lots of birds, flowers in the right season . Beautiful large front porch , ideal for relaxing or enjoying a glass of wine/ tea, or working on your laptop . Your room is on the main floor and very private, given it’s location in the house, ( see photos). It is bright, clean and cozy and aesthetically pleasing . Fresh towels and linens and tea and coffee available. Feel free to use the coffee bodem to make delicious coffee ;) NOTE: this room is for ONE PERSON-It’s a single bed. We are a dynamic, artistic , socially conscious family. We welcome all diversity. Old East village has been enjoying a transformation of late. Lots of independent artisans, crafts, artists, cafes, restaurants, antique stores, thrift shops have sprung up in the last couple of years. Enjoy some vegan cupcakes, delicious and locally sourced meals, a Saturday farmers market, or a walk around the quiet, friendly neighbourhood! Keri-Sue is a hospitable and considerate host with a wonderful energy and positive attitude. This is reflected in her home, where every aspect is welcoming, cozy, and a visual delight. It was a lovely stay and felt much too brief. It's always nice to stay at Keri-Sue's place. It's always clean and comfortable, and she's super nice! Keri is very kind and friendly host. Her apartment is nice and comfortable. Had a very comfortable & delightful stay at Keri’s home. Keri is a very welcoming host and the place was outstandingly clean and beautifully decorated. Very easy to reach from UWO campus by bus or car. I have stayed here before and it was, as always, a great time! Keri-Sue is so friendly and thoughtful! Comfy bedroom with queen bed and reading nook. Enjoy natural light through the window with a view of the backyard gardens. Chest of drawers and clothing rack with hangers available in the room. Check in/out is easy as we use a keyless entry system. Guests will find towels and other amenities clearly laid out in rooms and common spaces. Coffee, tea, and light breakfast items are provided (e.g., cereal, oatmeal, coffee, tea). Enjoy a quiet, relaxing stay in the heart of Old East Village - a vibrant, eclectic & artsy area of London. Walking distance to many unique shops, the Western Fair Farmer's Market & Casino, and many of the city's best restaurants & entertainment spots. Minutes from downtown, it is an ideal location for events such as concerts, sports, and festivals. Katie’s home is gorgeous, conveniently located and absolutely spotless. Great amenities, comfy arrangements, stylish decor, and good communication—couldn’t ask for more in an Airbnb! Super clean and chic. Katie's four legged fur baby is perfection. Katie's place was so convenient for my boyfriend and I to stay at as we went to The Factory for my birthday. This was a 3 minute drive from it. Once we arrived, there was her adorable dog Diego to greet us! Check-in was so quick and easy! When we came back, the house was so quiet, which was good after the workout we had. The room was clean and the bed so was so comfy. We had everything we needed to make sure our quick stay was comfortable. We’ll maintained clean place. Safe and convenient location. Definitely recommend this to anyone looking for a stay in old east village. Located in Old East Village. 15 min walking distance to Victoria Park, (Sunfest, Home County, Ribfest) 25 min to Harris Park (Canada Day and Rock the Park) and 5 min to Western Fair Casino/ Racetrack/Farmers Market. St Joe's Hospital 2.9 km. Quiet, clean house who host enjoys meeting people from different walks of life. Close to bus routes, restaurants. Street parking. Also 2nd bedroom listed as "Central Old East Village Home Away From Home. tres bon rapport qualite prix, je recommande cette adresse. Great value. There is also a room with a double bed, but I had the single bed which was fine - I just needed a place to freshen up and sleep. Emmeline was quick to respond to all my texts and was flexible when I changed my arrival time. She took care of the parking pass for staying overnight on the road in front of her place. She greeted me, was very friendly, gave me a thorough tour. I didn't use the kitchen or shared space living room, but it was great to know I could make a tea or coffee if I wanted. I would advise earplugs. It's not a busy area but London is a large city with fire trucks going in the middle of the night - but I am a bit of a light sleeper anyways. She had a trunk full of extra linens in case I was chilly. Really can't beat the price! Thanks Emmeline. Very Welcoming and friendly host. The house is well maintained. I completely loved my stay there. Emmeline's home was a great place for me to crash for a night. Check in was easy and she was easy to communicate with before and during my stay. I had some issues to get to Emmiline’s place and she was very thoughtful, once I got there everything was ready and neat. Unfortunately I stayed only one night at her place, even though she made me feel like home. I totally recommend this place. Bedroom has a comfortable queen bed. Accessibility to full kitchen, bathroom and living area. Includes tv in the bedroom and Kodi box in living room, internet, parking on property. Close to amenities, including a local bakery. Family oriented neighbourhood. Older home, newly renovated about 4yrs ago. Large bathroom with walk in shower. Bus routes in the area. Close to a Victoria Hospital. Close to downtown London. Parking in driveway for 1 car per room. House is a 3 bedroom house which are all bookings through airbnb. Quaint quiet family oriented neighborhood. Close to bus routes. Close to downtown. Bakery in walking distance. Friendly host, good location, nice neighbourhood. Amazing place! Second stay, will definitely be back. House is just as described. Erin is amazing at communication, made for easy parking. The house is very clean and beautiful. Host is very nice and easily approachable. Highly recommended! Heritage house, locate at Old Est Village London, Well maintained , quiet and clean. 5 minutes walking to Western Fair District, Casino , Shows , Farmer Market , Bakery , Coffee Shop , Restaurant, Tim Horton, Entertainment around neighborhoods , Bus stop available at the corner of the street. The house it is a very neat and clean , My satisfaction is that you are pleased and feel at home .I am going to share with you all the spaces of my house ,so you can fully enjoy the facilities including parking and backyard. Great Neighborhoods, fully of events and green community with conserving Heritage and outdoor ,Bike and walk trail, You can walk to places such as Restaurants, Cafes, Brewery , Bakery ,Farmer Market (open on Saturdays) ,Tim Horton and Variety store. We enjoyed staying in Alfredo’s beautiful home. It was nicely decorated, super clean, and in a very quiet neighborhood. Alfredo’s home is just a short walk away from a fabulous weekend farmer’s market that has food, and crafts and art. We brought our bikes with us and it was as easy commute to downtown where we had lots of yummy vegan choices. We didn’t actually see Alfredo in person, but both check-in and check-out was very easy and Alfredo was very accessible via text to answer questions. A very clean , comfortable space. Great host. Excellent stay at Alfredo's -- place is super clean, stylish, and also in a great location. We absolutely love Alfredo!!!!!! The house and location was incredible, Alfredo was so kind and fun. He gave us all the privacy in the world, and checked up on us and gave us recommendations on bars. It was like staying with family. We will be staying here again in the future. It was wonderful at Alfredo's house. he was super nice and kind to us. We will definitely return if we need to go to London again. Great guy, great place for 2. great hospitality. Great place. Very clean and comfortable. Great touches like fresh towels laid out and the location is ideal. Alfredo is very kind and helpful! Definitely a great value! This basement room is like an apartment with it's own private entrance, down 5 exterior steps. Enjoy a private bathroom, kitchenette & shared laundry area. Kitchenette has mini fridge, microwave, toaster oven, 2 burner hot plate with pots, dishes & silverware. Room has bed, desk, dining table, dresser and TV with DVD player & AppleTV. Perfect for people needing long-term stays for school, business, family in hospital, or for families who have children attending competitions or tournaments. Located on a quiet street, very close to Fanshawe College and Western Fairgrounds, close to downtown London, Budweiser Gardens, Centennial Hall, Covent Market, Victoria Hospital etc. Grocery & Convenience stores within walking distance, close to bus stop locations. Our neighbourhood is quiet and very easy to access from the 401 highway. We are half a block away from a bus stop and convenience store and two streets over from a large pond and walking trails. It is really very nice place. It is clean and has everything you may need . The host is kind . I will stay there for sure. Nice place to stay for a quick trip! First rate. Spacious room, lots of comfortable places to sit and read or work. Great place with great hosts. Old house but very quiet for me and my friends to sleep in. A very nice , clean unit. Located in Old East Village. 15 min walking distance to Victoria Park, (Sunfest, Home County, Ribfest) 25 min to Harris Park (Canada Day and Rock the Park) and 5 min to Western Fair Casino/ Racetrack/Farmers Market. St Joe's Hospital 2.9 km. Quiet, clean house who host enjoys meeting people from different walks of life. If you are a down to earth person, this is the place for you. Endroit très bien, Emmeline est une superhost et ce n'est pas pour rien. Elle réagit très rapidement au communications et c'était parfait pour moi pour ma nuit de passage à London. She was very attentive. She showed us the map of the city where to take the buses, shops, and so forth. Emmeline's home was exactly as advertised. Communicative, friendly and informative. Most certainly would stay here again. Thank you Emmeline for being such a wonderful host! Emmeline is a wonderful host, we got exactly what we paid for and then some. She is very welcoming and made us feel right at home. We will definitely use her place again if we decide to return to London. Emmeline is a wonderful host! Space is very clean. Would stay again (and have been here a number of times). Comfortable, quiet neighbourhood, very convenient for downtown and Highway 401. Bus service 1 block. Guests have use of house during stay including back yard, living room and kitchen. No additional charges or fees. Imy daughter and me stayed one night before the volleyball tournament in London. I asked for late check in, we arrived almost at midnight, Jon was waiting for us. The room is good, the bed was cozy, we have a great sleep before games. In the morning Jon offered coffee and cereal. It was absolutely great choice for us, cozy and great price. Great place & great host. He's a warm and welcoming man, and an interesting person. From the outset, it was very kind of him to stay up late to let me in, even though I would have had to arrive very late at night. Had I been able to stay longer, I would have liked to get to know him better :) Thanks! Very friendly & welcoming host. The place was very clean & tidy. Very comfy bed & good hot shower. THE BEST DEAL IN TOWN! Private Room Rental FREE Wi-Fi . FREE coffee,tea Washer/dryer Renovated older home in quiet neighbourhood. Property backs onto beautiful greenspace and bike path steps away. 5 minute drive to LHSC. 5 minute drive to Casino London, Western Fair Raceway and London Sport Centre. 8 minute drive to the city core to Budweiser Gardens & London Convention Centre Easy access and departure to 401. Perfect location if you just need a bed for the night or for a few days. Country like setting in the city. Beautifully renovated 2 story brick home. 1 bedroom with queen size bed available. Updated kitchen with full use of frig, stove, microwave, dishwasher, toaster and coffee maker. (Coffee/tea provided) Hardwood floors on the main floor, carpet upstairs in bedroom and hallway. Full bathroom upstairs. Half bathroom on the main floor. Formal dining room and living room. Large sun drenched deck with patio furniture and BBQ for your use and enjoyment. Large open green space backing onto property from the backyard leads to a quiet peaceful place. Hard to believe we are in the city. If you are a nature lover the river, bike path and walking trails are 1 block away. Parking onsite or street parking with permit. Host can arrange permit upon arrival. Minutes to London Health Science Centre (Victoria Hospital) by car Older more mature area. Lots of large trees. Homes are small but well cared for with the pride of ownership showing. There are 2 grocery stores nearby but if you do not have a car it is best to take the bus or cab as it would be to long of a walk with groceries. Library and beer store just 3 blocks away. Great experience, would stay again. Very welcoming. Very comfortable. Great neighbourhood. JJ was very helpful and friendly. She went over and above. Jane was an amazing host! My friend and I visited London for the weekend and she was so welcoming and gave us tips on where to go and how to get there. The house was super clean and comfortable. Location was great! Just a very short drive and you’re in downtown! Loved my stay and definitely will come back! My stay at Jjay's was very good. She is an attentive host and her tenant is very kind. Most necessary amenities were within a 1/2 hour walk. The kitchen was well supplied for cooking needs. The host was helpful and friendly. The house was cute, had character and was really clean. Well worth it’s value for sure. Make yourself completely at home in 'The MoJo'. Your perfect place to stay while visiting London! Centrally located in a quiet neighbourhood. Close to Victoria Hospital (1km), Wortley Village (3km), Budweiser Gardens (2.5km), and close to the highway 401 exit (8km) London Sports Park (100m) The Thames Valley Parkway (200m) This is the city's primary multi use pathway system. Situated on scenic park lands along the Thames River. 40km in length. Lots of amenities to make you feel at home! There are 2 bedrooms, each with a double bed. There is a couch Futon in the living area that can be converted for extra sleeping space if needed. Probably best for 1 adult or 2 children. Washer and dryer in the basement, including laundry detergent. Ironing board and Iron on main floor. Large backyard. Front covered porch. This place was wonderful! Rick and Erinn are great hosts, easy to get a hold of should you need anything. Check in was easy and convenient, the place was clean and well stocked with everything I needed. I would stay here again! Great stay! Super accommodating and hospitable. It's a cozy place near the center of London. We offer 1 bedroom place with a fully equiped kitchen and bathroom. Hope you'll enjoy your stay. The hosts are very welcoming and kind. The view is lovely and the room is cozy and nice. The place is very clean and has all that is needed for a comfortable and good stay. I would come again! Wonderful, thoughtful hosts! Clean and great private space. Andrew and Maria are great hosts! Very tidy and lovely AirBnb apartment equipped with everything you need. A good bed and nice bathroom. Maria is a great host and was always there when you need him. In simple words We had a great stay! Charming Airbnb, it’s a lovely space. The hosts were responsive to concerns. Exactly as expected. Super clean and quiet. Adrian was a great host! Clean and nice room, would definitely recommend it. Really nice room, host really kind, excellent value for its price. Simple, clean, quiet, did the trick for my three day stay. Calling all outdoors lovers! Centrally located room in a charming century home on the River. Backing onto green space, there are often deer and other wildlife. Beautiful century home with many updates. Note - this is a 100 year old home and the stairs are narrow and squeaky! Located close to the core, my home is a well kept century home backing on to the Thames River and wooded biking/hiking trails. Stay in a comfortable queen sized bed with access to shared bathroom and living space. Complimentary coffee and tea. Walking distance to the Western Fair District - home of Trackside Music Festival, the Beer Festival, Casino, Farmers Market and other weekly events. 5 mins from LHSC Victoria Hospital Ride your bikes downtown to save on parking and enjoy one of the many summer festivals and concerts in Victoria and Harris Park (Sunfest, Rock The Park, Rib Fest) Enjoy the full backyard with BBQ, pergola, hammock and fire pit. Nous recommandons la maison de Chantal et Brendon. Had a great stay. Bed was very comfortable and location was very quiet. Would definitely book again. Brendon's place exudes artistic charm and a country flair. The kitchen is beautifully redone with lovely light and granite features, and the backyard, though small provided a beautiful garden and firepit area for eating. The home is smaller than expected but tastefully done. Our only issues were a tight narrow and very creaky stairwell that made it difficult to carry luggage up and down in the dark without waking the neighbors. (The hall light was out.) Also, there were no batteries for remotes, and we couldn't watch the Sox game. Other than that, a very cute place and adequately stocked. Brendon was a wonderful host! Amazing house in a quiet district. Brendon and Chantal are the perfect host. I've really enjoy my time here and already miss Mo. Hope I will come there again. Thank you ! Brendon and Chantal are very friendly. We enjoyed meeting their dogs Moe and Beckham, and enjoyed our stay. The home was charming and unique and reflective of their personalities. The back patio was very comfortable as well. Chantal is wonderful and I had a lovely stay in her home. I will definitely be back! Country in the City - 10 min Drive to Downtown! Unique , upper fully contained 2 bedroom apartment in a heritage home in Old East Village. There is a finished attic with a gas fireplace. walking distance to Western Fair District and Casino, agriplex, micro breweries, and market. Approximately 2 km to downtown core, city parks and attractions including Budweiser Gardens. Guests have access to fenced backyard. Hot tub availability is by appt. Robin and her husband Jeff aim to please! Very pleasant couple and super hospitable. They checked to see how our stay was each day we saw them, and we're genuinely interested in making our stay as comfortable as possible. The apartment is well equipped for a multi night visit. Comfortable master bed, and the entire second/third floors are well decorated. If you find yourself looking for a place to stay in London ON. Robin and Jeff's place is a perfect choice! Excellent experience from start to finish. Jeff was super friendly. The place was clean and inviting. Lots of space to spread out and comfortable beds at the end of the day. This was a fantastic spot! Robin communicated quickly after our inquiry for booking and was patient with some issues I had in figuring out a glitch in my reservation. She greeted us right as we arrived and was a very warm and gracious host. The apartment was very clean, comfortable, and was a lovely place to stay. The bed was very comfy. Thanks so much for a wonderful experience! Robin was an amazing host. She was great with communication, would always respond very quickly with any questions I had. Her place is super quaint. I absolutely enjoyed staying there, & bonus the hot tub was enjoyable. :) I would recommend her place to anyone staying in London Ontario. Vey comfortable place, well appointed! Loved the second story hangout area! Such a cute space! This was my first experience with Airbnb and it was one to remember! Robin was so kind and accommodating. The apartment was super cute and cozy, tons of space! I would 100% recommend! This property is absolutely beautiful! The photos simply do not do it justice. I felt like I was back at home in London, England - Very historical, also stylish, clean and comfortable. The hosts are very attentive and we had everything we needed to enjoy our stay. Perfect location for any work trips at Western Fair District. Would stay again in a heartbeat. Our century home, built in 1895, is around the corner from the Western Fair in beautiful Old East Village. Near restaurants, the casino and racetrack, art, culture and more, see our Guidebook. You’ll love the bright 2 bedroom apartment with high ceiling and skylights, decorative (only) fireplace, and open kitchen. Great ambiance in a great location, and private keypad entrance with self checkin. Good for couples, solo adventurers, business travellers, & those transitioning between homes. Home away from Home. Very bright and cozy with 4 Skylights and sloped ceilings. Kitchen is stocked with dishes, utensils, and cooking gear for your use. Bathe by candlelight or by starlight. Hotel amenities provided. Enjoy! Heating controls in every room for personalized comfort. Soundbar and TV Bluetooth equipped. Bring a keyboard, play your own tunes. Please note: No smoking permitted inside. It was great to stay at Jeff and Christina's place for the night. We needed a place with two rooms and a living space and this was way better than paying for a hotel suite. Jeff was very friendly and available. They even prepared things in advance for us when they knew about some of our special needs. The beds were comfy and the apt was clean. But the suite smelled a bit like a smoker lived there (or used to). * not the best for people taller than 5'8 as there are some areas that you might bump your head on. But my 6 foot husband was okay all night. We enjoyed our stay with Christina & Jeff. They had a clean suite and had all the amenities that were necessary. They were very responsive to all of our requests. Their place is reasonably close to downtown London and is very close to public transport. Overall a wonderful stay! Booked this for two technicans for work. They appreciated that check in was smooth and the place was very clean. Charming place that includes a parking space, a private entrance, a kitchen stocked with some bare essentials if you arrive famished, and very clean and comfortable. Recommended. Never met hosts but interacting with them was clear and efficient. Good value. Cute apartment, close to downtown. Great host, put country music on the TV as she showed us the house because she knew we were in town for a country concert. Highly recommend. Place was clean and had flexible arrival time! Was also very clean! Well laid out, clean space. Super comfy couches and chaise. Nice upper deck area to relax and close walking proximity to great restaurants and farmers market. Easy to locate, off street parking. Firm beds, plenty of bedding and towels. Extras in the kitchen (we stayed 1 night, so didn’t use). Beds at the front on the 1-way road, so expect light traffic til around 11 pm as heading to downtown. Lovely area, safe to walk. Awesome skylights. Close to downtown , grocery store just around the corner. Coffee shop. College & University are close, public transit access , train station & bus station close . Trains /buses daily to Toronto. Our local recreation centre is just behind our home. I have a 4 bedroom home in a quite neighborhood, I live there with my niece & two Sheep Dogs. I have 2 rooms are fully furnished with a desk, closets & mirror with drawers. Queen size bed .Parking . Common areas GasBbq ,hot tub are available to use, kitchen, living room with Fireplace & TV. We live in a quite neighbor hood. Street is a no through street. Larger friendly family dog(s) on site. Friendly, quiet dogs accepted. Fenced backyard. Breakfast and access to laundry facilities can be arranged. Full breakfast $7.50 per guest; Laundry $3 a load. Please advise as to any special requests (breakfast, laundry, etc.) when booking. Rec centre with pool and skate park within very short walking distance. Grocery store also a short walk away. Located in the heart of London Ontario, close to UWO and Fanshaw and St. Josephs Victoria and Parkwood Hospital's! Our Newly Renovated cozy Basement apartment is waiting for you. Bus Stops, Supermarket and Laundromat are just 5 minute walk from the house! Parking available. We are perfectly located in the center of the city. 3 mins from a busy bus route, 3 mins from a Super market and right down the street for a laundry mat. Can't get better. Yes it can , the community center is a two minute walk..it feature a large pool for swimming or drop in aqua classes. Great place really cozy. Enjoyed our time the loction was good. Very nice place to stay, the room is well decorated, clean and nicely organized. Also, it has a separate entrance so you will have your own space. Landlord Betts is a very nice and enthusiastic lady and is happy to offer any helps if needed. Would like to come back again if get a chance next time. This place is great. I needed a place before I moved into my apartment as I moved to London for a job. Its spacious and so so comfortable. Lots of nice added touches above and beyond basic needs. Very comfy couches and bed. Nice big bathroom and great kitchenette for a short or longer stay! Would highly reccomend!! Close to UWO, Fanshaw , St. Joseph's, Downtown! This one bedroom apartment is clean, bright and newly renovated! It's close to downtown, public transportation and other essentials like grocery stores, drugstores and laundromats. 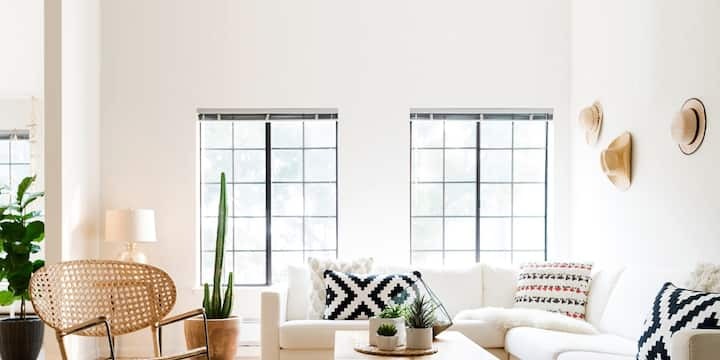 You'll love the high ceilings, bright windows and cozy decor! *Note*: This property has 4 separate apartments with separate entrances. Just let us know if you’re interested in booking multiple units and we can check the availability. Newly renovated, private 1 bedroom apartment. You'll have access to your own bedroom, kitchen, bathroom, living area and front porch. The apartment is located in a 4 unit house, but all the apartments are completely separate with separate entrances. Note: There is no laundry on-site but there are 2 laundromats very close by. It's a great place! My mom and I have a really wonderful time during the Christmas. Will come back to here if I need a place in London again. Has everything you need and very clean. Lots of extra towels, pillows, sheets and all of the kitchen items you could ask for. Only thing missing is laundry but if it’s a short stay then that’s not necessary. Leslie is a great host and responds right away. The ability to check in and out with just the code on the lock is great too. Very close to bus stops so easy to get anywhere you need to in London. Absolutely no complaints. Beautiful house. Perfect size for two people. Close to everything. Very accommodating. Great experience over all. This apartment was lovely, clean and in a great location! Totally recommend it to anyone staying in London! Thanks Leslie! Amazing stay! Leslie was more than willing to share local activities even when she was busy. Leslie goes above and beyond to make her space an excellent experience, from spotless surfaces to complimentary Netflix! Definitely recommend! Newly Renovated Apartment Near Downtown! This beautiful century home is located in the heart of Old East Village, London's hot spot for great breweries, restaurants, coffee shops, music and more. You are a 15 minute walk from Downtown London. On Saturday mornings, you're a 5 minute bike ride from London's best farmers market. It's a perfect place to stay to enjoy all that London has to offer. The house has an open floor layout on the main floor, including a kitchen, dining room, living room and a powder room. There is a lovely front porch and backyard space. The upstairs includes two bedrooms, an office, laundry, and bathroom (double sinks + shower). Beautiful heritage home in Old East Village! BIENVENUE sur ce semi-détaché entièrement mis à jour. 1 lit double, table de nuit et canapé avec 2 pc salle de bain privée. Entrée et sortie sans interruption - Nous voulons des colocataires conviviaux et un locateur qui font de la socialisation ou - Si vous voulez de l'intimité, fermez la porte =) Wifi, Netflix et de la nourriture tous inclus! Cette chambre est parfaite pour les voyageurs qui viennent avec beaucoup de bagages! S'il vous plaît lisez mon profil! L'espace est immense avec 2 lits et 3 places canapé ... Inachevée salle de bains avec toilettes et lavabo dans la buanderie, ils n'ont pas l'air jolie mais c'est propre et tout fonctionne! (Le savon à lessive n'est pas inclus et l'utilisation des installations est partagée pour toute la maison) L'étage principal dispose d'une cuisine commune et salle de séjour ... C'est la plus grande salle à la maison et pour les invités à court terme je ne me dérange pas de jeter un matelas là-bas pour presser 1 ou 2 personnes supplémentaires dans .. cependant plus de 5 (Ou 6 si c'est des enfants) devrait louer une autre chambre à l'étage, donc la maison n'est pas surchargé. J'ai 3 autres chambres à l'étage dans la maison ... Je suis ouvert à prendre sur un bail à long terme pour cette chambre - idéalement une personne de bonnes critiques serait génial! Si vous pensez que vous êtes un bon candidat me faire une offre je peux potentiellement donner un rabais pour une personne à plus long terme que la buanderie est par cette salle et je sais que ce n'est pas toujours pratique, mais je veux être sûr que je suis clair sur ce que La chambre offre donc mon exactitude est 5 étoiles en tout temps! Close to Victoria Hospital, not far from downtown London... 10 minutes from the 401... there are parks for walking. Parking may only be for 1 car at a time due to sharing a parking space with the lower unit guests. Our home is good for couples, solo adventurers, business travellers, and families (with kids) 2 Bedrooms . Located 8.5 Km from London Airport & a mere 1.5 Km to the Western Fair Race way & OLG . Very Close to BMO Centre arena 1.1 Km . Also Close to down town London only 3.4 Km. The place was perfectly as we were looking for with all the kitchen utilizes. Close to downtown as well. Mr. Basil were very nice and was accessible all the time. Very clean. Spacious and cozy. Suitable for families with children. The host was always available to answer questions or provide needed items. Close to the park and library, which was very convenient. We used Airbnb and text to communicate with Basil (the host). The place was nice and clean, with a full kitchen for us to use for our one-week stay. It was very easy to find the location of the house, which we had to text the host to get the exact house # before check-in day. We were happy with our choice to stay here. The only thing I would like to see is the steps outside leading to the house entrance fixed. They're broken and someone could potentially fall off the steps eventually if it doesn't get fixed. It was a bit difficult getting our heavy luggages up into the house but we managed. Didn't see the host the entire time, but was reachable via Airbnb website & app, as well as texting, as mentioned previously. I would consider a stay here in the future. It's close to my relatives. Basil was a great host. He was very responsive, helpful, and organized. We had an issue with the internet and within minutes he had his son come have and look. When he wasn't able to fix it, he had bell come in the next day and have it back up and running. The place was extreamly clean, for the older home it is. I was very impressed by the cleanliness. The place is well equipped from all the essentials you need to the little things that come in handy. The house is very spacious. For the price, the amount of space is a tremendous value. The master bedroom, is at the back of the house. No noise travels to or from the front of the house. The second bedroom is a great size with a closet and queen size bed. The house is very close to the casino, close to downtown, and 401. Overall this was a very comfortable and smooth Airbnb experience. Basil the host provided us with food and other thoughtful touches when we arrived which was great. He was very responsive and a great host. The squirrels in the roof however were a nuisance. Basil was very appreciative when we informed him. Reasonable value and good location. Adrian was very pleasant to deal with. It was mostly fine, but could have been a bit cleaner. Great stay!! Great place! My friend from out of town loved it! Thank you for accommodating him on such short notice! Private room in newly renovated home with many windows. Located minutes away from the 401 and the heart of downtown, major hospitals and on main corridor bus routes. Centrally located, neighbouring the Wortley Village area and historic South London steps away from the Thames River. Access to a fully equipped kitchen, dining area, living room with fireplace. Your room has a queen bed with closet space, convenient lighting, wingback chair and charging ports all for your convenience. There is a fully equipped kitchen. Each bedroom has USB ports available, a cozy reading chair and extra blankets. The comfortable living room has an electric fireplace and smart tv, perfect for some down time. The house is located on Wellington Road which is the main access from Hwy 401 to downtown London. Several bus routes are available just a few steps from the front door. The parking area can accommodate large vehicles if necessary. We are located steps from locally owned restaurants, a short drive to White Oaks Mall and Victoria Hospital. London is known as the forest city and the house is steps from parks, bicycle paths and the Thames River. It is also a 25 minute walk from downtown and neighbours the quaint neighbourhood of Wortley Village with boutiques, pubs and restaurants. Susan was a great host! The place was cozy and in a great location for my visit. I would definitely recommend! Bright and comfortable with a mix of modern amenities and heritage features, nestled in London’s Old East Village. The Victorian-style home was built in 1904 and has been lovingly renovated by a local artist and her craftsman husband to reflect its original owner, an engineer of the Canada Chemical Company. Featuring local art, the loft apartment is well-appointed with high ceilings, his and hers closets in the master bedroom and a bathroom with a separate shower and soaker tub. This is a perfect unit for long-term stays. There’s parking for one car; is on a bus route; and is minutes from downtown, hospitals, and the university. The convenient location is walking distance to quaint shops, microbreweries and vegan dining. This amazing historic gem in Old East London is walking distance from 10eighteen coffee shop, Tony’s pizza, Back to the Fuchsia retro shop and the Market at Western Fair. Victoria Park, St. Peter’s Basilica and tons of restaurants, record stores and other retail is only minutes away by car. Jen has thought of every detail when preparing the Chemist’s retreat: fully stocked kitchen with all the ingredients to make waffles provided, extra blankets, lots of mirrors and towels, closet space with hangers, recycling bin, etc. There is a second unit downstairs, so you will hear your neighbors through the heating vents, and vice versa. This is a charming home away from home at a great price! We would definitely stay here again. Jen is a great host and the Chemist's Retreat offers every amenity a guest could want for both a short and longer term stay. I would recommend this property to anyone. This charming accommodation is located in the up-and-coming Old East Village, and is close to Aeolian Hall. Jen's place has a the right decorative touches, plenty of information about London, and amazing fluffy towels! I highly recommend! staying at Jen's upper apartment was an experience of stepping back in time, when interior spaces were lofty and esthetically pleasing. Add to that a hostess with decorative flair, and this apartment was a very memorable experience. Need to come back and explore more of the neighborhood! The place contained everything you could have possibly needed. There were cute little touches such as waffle mix and a chalk board that had my name welcoming my friends and I. It was also very cute. Lovely spot. Jen was quick to answer any question we had and was very helpful. The house waffles were a lovely treat and a great way to start our day! The Chemist’s Retreat is such a welcoming, charming stay! It was so better than we expected. It included a very well equipped kitchen, insanely comfortable beds, lovely local art and a cozy living room. Jen had included so many thoughtful touches and the vintage, modern decor made for such a beautiful space in a fun part of town. Lots of cute cafes and shops around. Honestly wish I could move in! You will NOT be disappointed! I am an airbnb host and I use airbnb's a lot and this was one of the best. It's a very comfortable, inviting space. I stayed in the single bedroom and, while it's small, it was very cosy and comfortable (memory foam mattress topper was appreciated) and functional. My friend had the queen size bed room which also has a desk and two closets with lots of hangers. The kitchen is perfect and is well stocked. The living room is very comfortable and inviting. While we didn't turn it on even once, there's a TV too. The bathroom has a soaker tub and a great shower with amazing pressure and lots of hot water always. Jen is an artist and it shows in her eye for detail. From an extending magnifying mirror in the bathroom to waffle mix (along with the egg, milk and oil needed to make it) and soft blankets to use on each sofa to a selection of teas. Fluffy towels. Nice sheets. Art work on the walls. Very tastefully decorated. Easy parking. Great lock system (you get to choose the code). It wasn't an issue for us, but the stairs are a wee bit steep and narrow for bringing up suitcases. Altogether, I would HIGHLY recommend it. We are a family ready to share our home to you. We would like to offer you a great airbnb experience. When you come to our house you will feel like you never left home. I had an excellent experience, Cielo was very kind and generous. The space is large and comfortable. Cielo and her husband are sure to welcome you with open arms. They are a very pleasant, and obliging couple in every way. The home is spotlessly clean. Because we are an elderly couple, they helped with our luggage and made sure we were comfortable in every way. When I asked about a restaurant or coffee shop near by, her comment was "I will make you coffee in the morning" and she did. Maybe they could supply a little coffee set with amenities for the morning wake up. I think that would be a plus for them. Also I think having a working T.V. would be nice. Great location! Great and Kind hosts! Cielo and her family are very friendly and affectionate. We enjoyed our stay and is close to a lot of latin restaurants. Our next trip - We'll be staying here for sure. Thanks for hosting us. This couple has a beautiful home! They are welcoming, accommodating, generous, and understanding. Would stay here any day of the week (and would have family stay here). Thank you Cielo & Manuel! By far the most plesant airbnb experience Ive had. Cielo, a mother of 2, reminded me of when I stayed over at my best friends house and how his mom would treat me. Her friendliness, hospitality and attention to detail was evident and reflected in her house and room i stayed in. Amazing host and location. Cielo was very inviting. The room was spacious - a family room with couches, TV, desk, fridge, etc and a comfortable bed. Modern bathroom. Everything was clean and tastefully done. Cielo was absolutely lovely. She was available to greet me at my late (midnight) arrival and pointed out various amenities (mini fridge - that kept things VERY cold - stocked with water), fresh fruit, dimmer on lamp, etc.). Everything was as clean and neat as could be. I even got to meet the family's adorable little dog (who remained away until I requested an introduction). The basement was cool and comfortable - perhaps a bit humid with the air off at night - but a great respite from the heat outside! Highly recommended, and a great bargain. Your large private bedroom comes fully equipped! There's a queen size four poster bed with deluxe bedding, as well as a new 42 inch high definition television with cable tv and a Blu-ray/dvd player. Free wifi is available throughout the house. There is also a closet to hang your clothes, a dresser to store your clothing, books to read, a clock radio, and a bedside table with storage space for your other belongings. The ceilings are high, with a built in bookcase above the closet. This house is a unique space, having been tastefully muralled to a European theme throughout the main floor by an award winning artist. The bathroom is especially large and luxurious. The furnishings are upscale, and the atmosphere warm and inviting. In the backyard you will find a private garden retreat, complete with blooming flowers, a pond, a gazebo, a guest barbecue, fountains, statues, lots of seating and beautiful views. My house is centrally located, and you are 5 minutes from Victoria Hospital by car and 10 minutes by walking, 10 minutes from the Downtown core by car, the Via Rail Station, and Greyhound Bus Lines, as well as Victoria Park which is one of the best venues for weekend events all summer. For those without a car the city Metro has a bus stop very close by. There are also taxi cabs and Uber which are available 24 hours a day. Walking and hiking trails, as well as bicycle trails are less than a block away from my house. The biking trails are extensive and can lead to many parts of the city, including the downtown core. There are also many fine restaurants such as The Keg or Chops, Whiteoaks Mall, Landmark Cinemas, TD Canada Trust, Tim Hortons, MacDoalds, Metro, Shoppers Drug Mart and many other fine stores and amenities on the Wellington Road strip which is located less than five minutes away from my house by car. Wellington Road takes you directly to the downtown area. If you need any help arranging something, please ask. I am a very accommodating host, and I want you to have a memorable stay! Guests are given full access to all common spaces on the main floor, including the living room as well as the fully equipped kitchen. The main floor bathroom is oversized with a walk in shower and jacuzzi bathtub. A complimentary breakfast is standard for every guest, which includes my own homemade chocolate banana bread. A Nescafe Dolce Gusto coffee maker with deluxe individual coffee pods are available free to guests throughout the day. My house is centrally located in a quiet location of the city. It is close to many theatres, fine dining, grocery stores, gyms, banks, malls and other desirable businesses. It is also close to Victoria Hospital, which is within walking distance or less than five minutes by car or taxi. Via Rail, Greyhound, and Victoria Park is ten minutes away by car. There is always something fun happening at Victoria Park during the summer, such as Movies in The Park, Sunfest, Ribfest, or The Home County Folk Festival. My property is very private and unique, both inside and out. Walking and hiking trails, as well as bicycle trails are less than a block away from my house. Parking is always available. I'm sure you will be quite happy and comfortable during your stay here. A delightful experience and amazingly decorated home. Thanks for everything. Professional and very helpful. Clean and comfortable. Dave's airbnb is the most impressive and elegant one in my airbnb history. His house just like an Italian palace with beautiful decoration. There is a large garden behind his house, but sadly London kept raining and flowers had been wizen when I was there. Dave is a very caring person and he will try his best to help you when you have any problem. In conclusion, choose him as your airbnb and I am sure you will not regret at all. Dave’s place was great! We had a good vibe from the start even just with booking. The pics looked great on the site and when we got there it was definitely true to what we had envisioned. The place is exquisite and Dave was incredibly helpful and hospitable. He did make sure there was fresh chocolate banana bread for us when we arrived and it was delicious. The bedroom is located on the same floor as the bathroom so it’s super easy to go to and from and we didn’t get a chance to use the big tub/fireplace but it would’ve been lovely. House was super clean and smelled really nice. Overall great stay!!!! We would definitely go back again. Thanks Dave!!!!! Dave was a wonderful host. The place is amazing. The house is very thoughtfully done. It was like being in the ancient Roman times and treated like royalty. The breakfast was homemade and was awesome. Me and my family had a great time. I would highly recommend it for anyone visiting London. Dave is definitely a super host. All of the little details were taken care of. The home is very well decorated and super clean. I would stay again. Cozy bedroom with queen sized bed, window seat, and two comfy reading chairs. Enjoy natural natural light through the window with a view of the front garden. Closet space available in the room. Check in/out is easy as we use a keyless entry system. Guests will find towels and other amenities clearly laid out in rooms and common spaces. Coffee, tea, and light breakfast items are provided (e.g., cereal, fresh fruit). Guests may use the kitchen space for preparation of small meals should they bring their own groceries. Limited fridge space available. Very friendly and kind. Clean, I staunchly suggest that. Amazing place! Very stylish decorating and very unique. So cute and cozy ! Definitely coming back next time I’m in London. Katie’s place was comfortable, cozy, well-decorated, and the perfect home away from home! Bedroom has a comfortable double bed. Accessibility to full kitchen, bathroom and living area. Includes internet and parking on property. Close to amenities, including a local bakery. Family oriented neighbourhood. Erin a été très accueillante et nous a permis d'arriver tôt le premier jour et laisser nos bagages tard le dernier jour. La chambre est très calme et relaxante, il n'y a presqu'aucun bruit. Cependant, elle est loin du centre mais tout de même accessible à pied. Erin has a very nice, clean and cozy house in London which has everything needed for an enjoyable stay! Even though we only met briefly, Erin was very accommodating (we arrived quite late and she still managed to arrange a parking spot for us!) and communication was perfect. Thanks Erin. Great place to stay for a short stay. Nice home in a quiet neighborhood. Erin was a good host. She explained us well how to find her house. Erin was a great host. I particularly liked the punch in code for the door which reduced the worry about keys. Everything was easy to find and there was good information in the room if your new in town to use and get around. Would definitely go back. The Airbnb was clean and exactly how described on the ad. Thanks for having me!! Erin was a great host. She tried to make our entrance seamless even though she was not at home. We appreciated having coffee and tea available. Thank you Erin. It was a good value. Bedroom has a comfortable double bed. Accessibility to full kitchen, bathroom and living area. Includes internet, parking on property and shared kitchen, living room and bathroom. Close to amenities, including a local bakery. Family oriented neighbourhood. Older home, newly renovated. Large bathroom with walk in shower. Bus routes in the area. Close to a Victoria Hospital and downtown London. Parking in driveway for 1 car per room. House is a 3 bedroom house which are all bookings through airbnb. Quaint quiet family oriented neighborhood. Bakery within walking distance. Nice river close by to walk through and enjoy the scenery. I had a great time at Erin's home. She was very friendly, available and very accommodating. It is very convenient area, quite and close to lots of restaurants and downtownish. Sulhi. Erin responded promptly to a last-minute booking, and accommodated my fairly late arrival without difficulty. The room is clean, pleasant, and comfortable. Great especially for the price. ~40min bus to uwo campus (3B then 9 or 2). Very beautiful and comfortable place to stay. The place is very convenient to go places. The house is clean. Have no problems with communications and she give details informations before my come so I have no problems check-in. Had a great stayed. Welcome to London On, Cozy 1 bedroom apartment close to Universtiy's and Hospitals. If you're staying for the weekend or staying for many months. Universities, Hospitals, shopping and parks you will find yourself in the middle of everything you will want to find. There is parking available for one normal sized car. Please no trucks. The bus stop is only 20 meters away! Full kitchen, bathtub, 1 bedroom and living room. This is a cozy one bedroom apartment in an older house on the second floor, above a Tattoo Parlor business on a main street. The bus stop is only 20 meters away! From there you can reach anywhere in the city. :-D This is a whole apartment for your use. The apartment is about 255sq feet, so it is quite small. There is another apartment right next to this one in the same house. There is a small living room, a small bedroom and a small kitchen and bathroom with a tub. Old Eastvillage, You are close to Western Fair Aeolian Hall The Grand Theatre Western Fair and Raceway Casino EMAC Recording Studio Palace Theatre Saturday Farmer's Market Very vibrant and well loved! very economic choice. cosy and clear. Nice stay in quite location. Clean and tidy. A very nice airbnb. We were there for 6 weeks and it was very cosy and felt homey. Nice bakery and lunch place very close and the small shop just on Adelaide. My 6 month stay at Charls place was perfect! She is very responsive and attentive. I felt at home =) The apartment is very well equipped too ! This is a well thought out Airbnb. The unit is clearly designed just for Airbnb guests and has everything you might need. The bathroom was a little cramped, but served our purposes just fine. There was just the right amount of table and shelf space to easily keep everything organized and accessible. Within a few minutes of entering the unit we felt right at home. If you just need a base from which to explore London, this is a great place.